Our home is our lifetime investment and the most cherished residence no doubt. But during your first entry or tenure, if you found your dream home is termite infested, it could be an utter shock to you. Termites are one of the destructive creatures which can silently ruin up your building structure, furniture, healthy living and many more. If you want to know how termite can harm your home, it is also essential to know a little bit about their types to understand their infestation nature. Moreover, identifying the specific type will be easier depending on your living area and climate. There are mainly four types of termites existing in this world and based on their unique nature they can harm your home and health. Subterranean termites: This type of termites lives in moist areas and above the ground. Using mud channel, they move from one place to another to collect foods. This is the most destructive type because of their feeding capacity which lasts for 24 hours a day and seven days a week. Formosan termites: This is the most aggressive. They also live in underground colonies and using mud ways they move inside the walls of a structure. The most frustrating fact about this type is they are difficult to control if infested once. Dampwood termites: As the name suggests, they live in the humid and woody environment especially in trees and wooden structure. A leaky roof is the breeding heaven for such termites. Drywood termites: These termites do not contact soil and infest through dry wood. 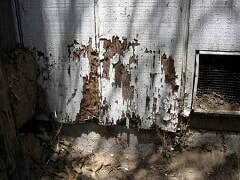 Associated damages to the termites mentioned above. Here is a look at a few reasons why you need termite control. The ravenous eating habit of termites’ especially subterranean termites severely damages the structural foundation of a building. These termites chew the beams on their way. As the floor supports grow weaker, cracks appear from floor to ceiling. As a consequence, the balance of the foundation become weaker, and it compresses doors and window frames. Laminate floors, wooden floors are more prone to termite attacks. Termites’ especially subterranean termites dig tunnels through concrete and damage the floors. Drywood termites play the primary role in roof damage. It happens as the termites eat the tiles and wooden shingles gradually and the support ultimately falls through. Major roof structures such as beams, ceiling collapse ultimately due to such termite infestation. Whether it is a concrete wall or wooden wall termite can erode the structure gradually due to their feeding habit. As the termites consume woods of doors and windows, it causes cracks, jam into it. It ultimately makes them difficult to use. Termite attack can be a severe issue for your property. And you could play it safe with termite treatment. Save your home from termite infestation. Termite services cost isn't as high as before, and could help you ensure you have a safer home.